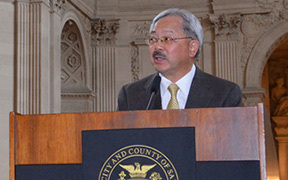 Mayor Edwin M. Lee today launched the Safe and Clean Neighborhoods Promise, a new initiative to improve the quality of life in all of San Francisco’s neighborhoods with a new comprehensive and coordinated approach to delivering City services better and faster to neighborhoods. The Mayor issued an Executive Directive to Department Heads that are responsible for neighborhood quality of life issues directing them to prioritize and focus on programs and services so that all residents feel safe in their homes and neighborhoods and that all residents have access to clean, well maintained public spaces and facilities, such as parks, public transportation, sidewalks, and streets. To ensure success, Mayor Lee also announced a series of Neighborhoods Promise new funding including expanded street cleaning and Pit Stops and the hiring of more police officers to walk beats in the neighborhoods.